Ingredients: cocoa mass, sweetner (Maltitol - E965), cocoa butter, emulsifier: soy lecithin (E322), natural vanilla (cocoa solids 55% min). Allergy information: Contains soy. May contain traces of nuts and milk as these products are handled in our factory. Vegan friendly. Gluten free. Dairy free. 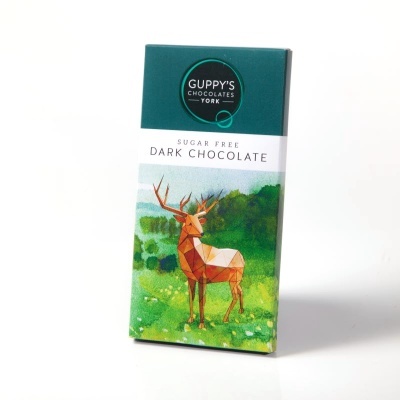 We wanted to make a dark chocolate bar that was suitable for diabetics and people managing their sugar intake, but still deliciously tasty. We use Maltitol as a sugar substitute, which has fewer calories, but is virtually identical in taste to sugar when used in chocolate. We think this bar really delivers on taste. Packaged in a sealed bag and a cardboard outer.